Is it a while since you left school? Are you thinking about going to uni after a break from your last study? La Trobe Mildura is a great option. 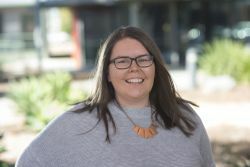 We have a strong group of mature-age students (students aged 21 and over), and because we are a smaller campus, our students benefit from more one-on-one time with La Trobe staff. The Tertiary Preparation Program is an enabling program that provides strong foundational skills and strategies for learning and prepares students for university. For detailed course and contact information, please visit the Tertiary Preparation Program website.